In 1910, Theodore Roosevelt gave a speech in Paris called “Citizen in a Republic”. It outlined several of the characteristics necessary for citizens in a republic to have. 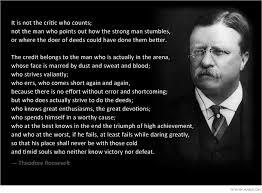 There is a particular excerpt from that speech that talks about the “Man in the Arena”. It bemoans the role of the critics and praises the value of the “doer of deeds”. Despite this speech being a century old, it’s message rings true today. In 1988, I was in the 7th grade and the “Man in the Arena” excerpt caught my eye. It was framed in the front of Mr. Tomlinson’s classroom. Since that year, I have had that quote basically memorized. In the beginning, I was drawn in by the gritty language, “whose face is marred by dust and sweat and blood.” Over the years, the meaning and the gravity of the words have changed. I no longer picture gladiators or sportsmen when I read it. Now I picture everyday people choosing to do important things or choosing to become critics. Mostly I see young people who are being thrust into a new and uncertain world. Their willingness to “get into the arena” may be our hope for the future. As we leave a century where there was a pre-scripted plan for success. The new century has already proven tumultuous and the winners seem to be the ones who are willing to “dare greatly”. I hope that you are willing to step into the arena. The arena of life that demands that you act and not critique. The place where you find your greatest passions and devotions. In the arena, you will not be shielded from failure but instead will face it and learn to dance with it. “There is no effort without error and shortcoming.” Be willing to fail forward, so that your triumph is greater because it came with a cost. The cost of action, passion and bravery that not everyone is willing to pay.